The name of the game “Jacks or Better” refers to the fact that the lowest (or least valuable) standard poker hand that will payout in this game is a pair of Jacks. 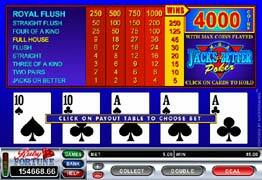 Jacks or Better has no wild cards and pays out a maximum of 4000 coins for a Royal flush. The object of 4-Line Jacks or Better is to obtain a five-card poker hand that contains a winning combination. It differs from original Jacks or Better, since it has four lines of cards. The better your hand, the bigger the payout. You choose how many and which of your cards are to be replaced. You may replace your cards only once. 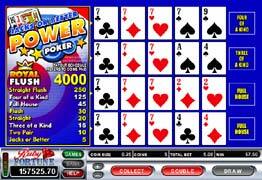 Jacks or Better Power Poker is different from the standard Jacks or Better video poker, as you play four identical hands of cards. At the beginning of each game the first hand is shown to you, with the other three hands remain face down.